For other uses, see Mermaid (disambiguation). In folklore, a mermaid is an aquatic creature with the head and upper body of a female human and the tail of a fish. Mermaids appear in the folklore of many cultures worldwide, including the Near East, Europe, Asia, and Africa. The first stories appeared in ancient Assyria, in which the goddess Atargatis transformed herself into a mermaid out of shame for accidentally killing her human lover. Mermaids are sometimes associated with perilous events such as floods, storms, shipwrecks, and drownings. In other folk traditions (or sometimes within the same tradition), they can be benevolent or beneficent, bestowing boons or falling in love with humans. Some of the attributes of mermaids may have been influenced by the Sirens of Greek mythology. Historical accounts of mermaids, such as those reported by Christopher Columbus during his exploration of the Caribbean, may have been inspired by manatees and similar aquatic mammals. While there is no evidence that mermaids exist outside folklore, reports of mermaid sightings continue to the present day, including 21st-century examples from Israel and Zimbabwe. Sirenia is an order of fully aquatic, herbivorous mammals that inhabit rivers, estuaries, coastal marine waters, swamps and marine wetlands. Sirenians, including manatees and dugongs, possess major aquatic adaptations: arms used for steering, a paddle used for propulsion, and remnants of hind limbs (legs) in the form of two small bones floating deep in the muscle. They look ponderous and clumsy but are actually fusiform, hydrodynamic and highly muscular, and mariners before the mid-nineteenth century referred to them as mermaids. Sirenomelia, also called "mermaid syndrome", is a rare congenital disorder in which a child is born with his or her legs fused together and small genitalia. This condition is about as rare as conjoined twins, affecting one out of every 100,000 live births and is usually fatal within a day or two of birth because of kidney and bladder complications. Four survivors were known as of July 2003. Depictions of entities with the tails of fish, but upper bodies of human beings appear in Mesopotamian artwork from the Old Babylonian Period onwards. These figures are usually mermen, but mermaids do occasionally appear. The name for the mermaid figure may have been kuliltu, meaning "fish-woman". Such figures were used in Neo-Assyrian art as protective figures and were shown in both monumental sculpture and in small, protective figurines. Atargatis depicted as a fish with a woman's head, on a coin of Demetrius III. The first known mermaid stories appeared in Assyria c. 1000 BC. The goddess Atargatis, mother of Assyrian queen Semiramis, loved a mortal (a shepherd) and unintentionally killed him. Ashamed, she jumped into a lake and took the form of a fish, but the waters would not conceal her divine beauty. Thereafter, she took the form of a mermaid — human above the waist, fish below — although the earliest representations of Atargatis showed her as a fish with a human head and arm, similar to the Babylonian god Ea. The Greeks recognized Atargatis under the name Derketo. Sometime before 546 BC, Milesian philosopher Anaximander postulated that mankind had sprung from an aquatic animal species. He thought that humans, who begin life with prolonged infancy, could not have survived otherwise. A popular Greek legend turned Alexander the Great's sister, Thessalonike, into a mermaid (Greek: γοργόνα) after her death, living in the Aegean. She would ask the sailors on any ship she would encounter only one question: "Is King Alexander alive?" (Greek: "Ζει ο Βασιλεύς Αλέξανδρος;"), to which the correct answer was: "He lives and reigns and conquers the world" (Greek: "Ζει και βασιλεύει και τον κόσμον κυριεύει"). This answer would please her, and she would accordingly calm the waters and bid the ship farewell. Any other answer would enrage her, and she would stir up a terrible storm, dooming the ship and every sailor on board. "Among them – Now that is the traditional story among them concerning the temple. But other men swear that Semiramis of Babylonia, whose deeds are many in Asia, also founded this site, and not for Hera but for her own mother, whose name was Derketo." "I saw Derketo's likeness in Phoenicia, a strange marvel. It is woman for half its length; but the other half, from thighs to feet, stretched out in a fish's tail. But the image in the Holy City is entirely a woman, and the grounds for their account are not very clear. They consider fish to be sacred, and they never eat them; and though they eat all other fowls they do not eat the dove, for they believe it is holy. And these things are done, they believe, because of Derketo and Semiramis, the first because Derketo has the shape of a fish, and the other because ultimately Semiramis turned into a dove. Well, I may grant that the temple was a work of Semiramis perhaps; but that it belongs to Derketo I do not believe in any way. For among the Egyptians some people do not eat fish, and that is not done to honor Derketo." In his Natural History 9.4.9-11, Pliny the Elder describes numerous sightings of mermaids off the coast of Gaul, noting that their bodies were covered all over in scales and that their corpses frequently washed up on shore. He comments that the governor of Gaul even wrote a letter to Emperor Augustus to inform him. The One Thousand and One Nights collection includes several tales featuring "sea people", such as "Djullanar the Sea-girl". Unlike depictions of mermaids in other mythologies, these are anatomically identical to land-bound humans, differing only in their ability to breathe and live underwater. They can (and do) interbreed with land humans, and the children of such unions have the ability to live underwater. In the tale "Abdullah the Fisherman and Abdullah the Merman", the protagonist Abdullah the Fisherman gains the ability to breathe underwater and discovers an underwater society that is portrayed as an inverted reflection of society on land. The underwater society follows a form of primitive communism where concepts like money and clothing do not exist. In "The Adventures of Bulukiya", the protagonist Bulukiya's quest for the herb of immortality leads him to explore the seas, where he encounters societies of mermaids. For more on the Irish mermaid, see merrow. Mermaids from the Isle of Man, known as ben-varrey, are considered more favorable toward humans than those of other regions, with various accounts of assistance, gifts and rewards. One story tells of a fisherman who carried a stranded mermaid back into the sea and was rewarded with the location of treasure. Another recounts the tale of a baby mermaid who stole a doll from a human little girl, but was rebuked by her mother and sent back to the girl with a gift of a pearl necklace to atone for the theft. A third story tells of a fishing family that made regular gifts of apples to a mermaid and was rewarded with prosperity. Raymond discovers Melusine in her bath. Jean d'Arras, Le livre de Mélusine, 1478. The best-known example of mermaids in literature is probably Hans Christian Andersen's fairy tale, The Little Mermaid, first published in 1837. In the original story, a young mermaid falls in love with a human prince whom she saves from drowning when his ship is wrecked in a storm. Although her grandmother tells her not to envy humans, who live much shorter lives than mermaids, and whose only consolation is an immortal soul, the mermaid chooses to risk her life in order to be with the prince. She trades her tongue and her beautiful voice to the sea-witch in exchange for a draught that will make her human and allow her to live on land. She will have to rely on her beauty and charm to win the prince's love, as she will be entirely mute. The sea-witch warns the mermaid that, although she will be graceful, each step will feel as though she is stepping on knives; and that if she does not earn the prince's love, she will die of a broken heart after he weds another. The spell is worked, and the mermaid is found by the prince, who sees the resemblance between her and the one who rescued him from drowning, although he does not realize that they are the same person. 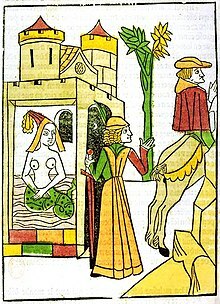 Although the prince cares deeply for the mermaid, he is betrothed to the daughter of a neighboring king, and the mermaid cannot prevent their marriage. The mermaid's sisters trade their beautiful hair to the sea-witch for a knife that the mermaid can use to break the spell and return to the sea. She must kill the prince before dawn on the day after his wedding. But the mermaid still loves the prince and cannot harm him. She flings the knife into the sea and jumps in after it, then begins to dissolve into foam. Then she is transformed into one of the daughters of the air, ethereal beings who strive to earn an immortal soul by doing good deeds in the world of men. A world-famous statue of the Little Mermaid, based on Andersen's fairy tale, has been in Copenhagen, Denmark since August 1913, with copies in 13 other locations around the world – almost half of them in North America. In 1989, Walt Disney Studios released a full-length animated film based on the Andersen fairy tale. Featuring an Academy Award-winning soundtrack with songs by Alan Menken and Howard Ashman, the film garnered glowing reviews, and was credited with revitalizing both the studio and the concept of animated feature films. Notable changes to the plot of Andersen's story include the elimination of the grandmother character and the religious aspects of the fairy tale, including the mermaid's quest to obtain an immortal soul. The sea-witch herself replaces the princess to whom the prince becomes engaged, using the mermaid's voice to prevent her from obtaining the prince's love. However, on their wedding day the plot is revealed, and the sea-witch is vanquished. The knife motif is not used in the film, which ends with the mermaid and the prince marrying. Among other things, the film was praised for portraying the mermaid as an independent and even rebellious young woman, rather than a passive actor content to let others determine her destiny. Rusalkas are the Slavic counterpart of the Greek sirens and naiads. The nature of rusalkas varies among folk traditions, but according to ethnologist D.K. Zelenin they all share a common element: they are the restless spirits of the unclean dead. They are usually the ghosts of young women who died a violent or untimely death, perhaps by murder or suicide, before their wedding and especially by drowning. Rusalkas are said to inhabit lakes and rivers. They appear as beautiful young women with long pale green hair and pale skin, suggesting a connection with floating weeds and days spent underwater in faint sunlight. They can be seen after dark, dancing together under the moon and calling out to young men by name, luring them to the water and drowning them. The characterization of rusalkas as both desirable and treacherous is prevalent in Russia, Ukraine and Belarus, and was emphasized by 19th-century Russian authors. The best-known of the great Czech nationalist composer Antonín Dvořák's operas is Rusalka. 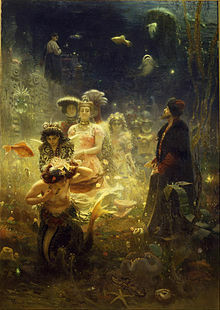 In Sadko (Russian: Садко), an East Slavic epic, the title character—an adventurer, merchant, and gusli musician from Novgorod—lives for some time in the underwater court of the "Sea Tsar" and marries his daughter, Chernava, before finally returning home. The tale inspired such works as the poem "Sadko" by Alexei Tolstoy (1817–75), the opera Sadko composed by Nikolai Rimsky-Korsakov and the painting by Ilya Repin. Korea is bounded on three sides by the sea. In some villages near the sea in Korea, there are mysterious stories about mermaids. Mermaids have features just like humans and Kim Dam Ryeong, who was a mayor of the town, saved four captured mermaids from a fisherman, as recorded in the Eou yadam (unofficial histories). In Dongabaek Island of Busan, there's a tale of Princess Hwang-Ok from the kingdom of Naranda, a mythical undersea kingdom of mermaids. Another tale concerns a mermaid named Sinjike who warned fishermen of impending storms by singing and throwing rocks into the sea from Geomun Island. The island's residents believed her to be goddess of the sea and that she could predict the weather. Mermaids are included in the Shanhaijing (Classic of Mountains and Seas) compilation of Chinese geography and mythology, dating from the 4th century BC. A 15th-century compilation of quotations from Chinese literature tells of a mermaid who "wept tears which became pearls". An early 19th-century book entitled Jottings on the South of China contains two stories about mermaids. In the first, a man captures a mermaid on the shore of Namtao island. She looks human in every respect except that her body is covered with fine hair of many colors. She can't talk, but he takes her home and marries her. After his death, the mermaid returns to the sea where she was found. In the second story, a man sees a woman lying on the beach while his ship was anchored offshore. On closer inspection, her feet and hands appear to be webbed. She is carried to the water, and expresses her gratitude toward the sailors before swimming away. Suvannamaccha and Hanuman, mural at Wat Phra Kaew, Bangkok. Mami Water (Lit. "Mother of the Water") are water spirits venerated in west, central and southern Africa, and in the African diaspora in the Caribbean and parts of North and South America. They are usually female, but are sometimes male. They are regarded as diabolical beings, and are often femme fatale, luring men to their deaths. The Persian word "برایم بمان" or "maneli" means "mermaid". [Human] nature is internally inconsistent, that our continuities with, and our differences from, the earth's other animals are mysterious and profound; and in these continuities, and these differences, lie both a sense of strangeness on earth and the possible key to a way of feeling at home here." In 1493, sailing off the coast of Hispaniola, Christopher Columbus reported seeing three "female forms" which "rose high out of the sea, but were not as beautiful as they are represented". The logbook of Blackbeard, an English pirate, records that he instructed his crew on several voyages to steer away from charted waters which he called "enchanted" for fear of merfolk or mermaids, which Blackbeard himself and members of his crew reported seeing. These sightings were often recounted and shared by sailors and pirates who believed that mermaids brought bad luck and would bewitch them into giving up their gold and dragging them to the bottom of the sea. Two sightings were reported in Canada near Vancouver and Victoria, one from sometime between 1870 and 1890, the other from 1967. A Pennsylvania fisherman reported five sightings of a mermaid in the Susquehanna River near Marietta in June 1881. In the middle of the 17th century, John Tradescant the elder created a wunderkammer (called Tradescant's Ark) in which he displayed, among other things, a "mermaid's hand". P. T. Barnum's 19th century taxidermal hoax called the Fiji mermaid has been mentioned above. Others have perpetrated similar hoaxes, which are usually papier-mâché fabrications or parts of deceased creatures, usually monkeys and fish, stitched together for the appearance of a grotesque mermaid. In the wake of the 2004 tsunami, pictures of Fiji "mermaids" circulated on the Internet as supposed examples of items that had washed up amid the devastation, though they were no more real than Barnum's exhibit. The topic of mermaids has arisen in several instances of scientific scrutiny, including a biological assessment of the unlikelihood of the supposed evolutionary biology of the mermaid on the popular marine science website, DeepSeaNews. Five of the primary reasons listed as to why mermaids don't fit current evolutionary understanding include: 1) thermoregulation (adaptations for regulating body heat), 2) evolutionary mismatch, 3) reproductive challenges, 4) digestive differences between mammals and fish, and 5) lack of physical evidence. Mermaids were also visited in a tongue-in-cheek scientific article by University of Washington emeritus oceanographer Karl Banse. His article was written as a parody, but mistaken as a true scientific exposé by believers as it was published in a scientific journal. Arthur Rackham, Rhinemaidens, from The Rhinegold & The Valkyrie (1910). Famous in more recent centuries is the fairy tale "The Little Mermaid" (1836) by Hans Christian Andersen, whose works have been translated into over 100 languages. 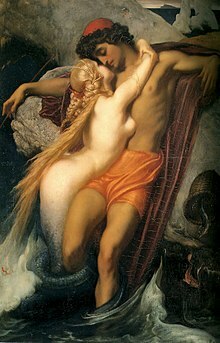 The mermaid (as conceived by Andersen) is similar to an Undine, a water nymph in German folklore who could only obtain an immortal soul by marrying a human being. Andersen's heroine inspired a bronze sculpture in Copenhagen harbour and influenced Western literary works such as Oscar Wilde's The Fisherman and His Soul and H.G. Wells' The Sea Lady. Sue Monk Kidd wrote a book called The Mermaid Chair loosely based on the legends of Saint Senara and the mermaid of Zennor. Sculptures and statues of mermaids can be found in many countries and cultures, with over 130 public art mermaid statues across the world. Countries with public art mermaid sculptures include Russia, Finland, Lithuania, Poland, Romania, Denmark, Norway, England, Scotland, Ireland, Germany, Netherlands, Belgium, France, Spain, Italy, Austria, Switzerland, Greece, Turkey, India, China, Thailand, South Korea, Japan, Guam, Australia, New Zealand, Brazil, Ecuador, Colombia, Mexico, Cayman Islands, Mexico, Saudi Arabia (Jeddah), the United States (including Hawaii and Virgin Islands) and Canada. Some of these mermaid statues have become icons of their city or country, and have become major tourist attractions in themselves. The Little Mermaid statue in Copenhagen is an icon of that city as well as of Denmark. The Havis Amanda statue symbolizes the rebirth of the city of Helsinki, capital of Finland. The Syrenka (mermaid) is part of the Coat of Arms of Warsaw, and is considered a protector of Warsaw, capital of Poland, which publicly displays statues of their mermaid. Musical depictions of mermaids include those by Felix Mendelssohn in his Fair Melusina overture and the three "Rhine daughters" in Richard Wagner's Der Ring des Nibelungen. Lorelei, the name of a Rhine mermaid immortalized in the Heinrich Heine poem of that name, has become a synonym for a siren. The Weeping Mermaid is an orchestral piece by Taiwanese composer Fan-Long Ko. 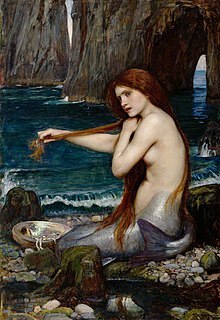 An influential image was created by John William Waterhouse, from 1895 to 1905, entitled A Mermaid. An example of late British Academy style artwork, the piece debuted to considerable acclaim (and secured Waterhouse's place as a member of the Royal Academy), but disappeared into a private collection and did not resurface until the 1970s. It is currently once again in the Royal Academy's collection. Mermaids were a favorite subject of John Reinhard Weguelin, a contemporary of Waterhouse. He painted an image of the mermaid of Zennor as well as several other depictions of mermaids in watercolour. Film depictions include the romantic comedy Splash (1984) and Aquamarine (2006). A 1963 episode of the television series Route 66 entitled "The Cruelest Sea" featured a mermaid performance artist working at Weeki Wachee aquatic park. Mermaids also appeared in the popular supernatural drama television series Charmed, and were the basis of its spin-off series Mermaid. In She Creature (2001), two carnival workers abduct a mermaid in Ireland c. 1900 and attempt to transport her to America. The film Pirates of the Caribbean: On Stranger Tides mixes old and new myths about mermaids: singing to sailors to lure them to their death, growing legs when taken onto dry land, and bestowing kisses with magical healing properties. Animated films include Disney's musical version of Andersen's tale, The Little Mermaid, and Hayao Miyazaki's Ponyo. The Australian teen dramedy H2O: Just Add Water chronicles the adventures of three modern-day mermaids along the Gold Coast of Australia. A shield and sword-wielding mermaid (Syrenka) is on the official coat of arms of Warsaw. Images of a mermaid have symbolized Warsaw on its arms since the middle of the 14th century. Several legends associate Triton of Greek mythology with the city, which may have been the origin of the mermaid's association. Interest in mermaid costuming has grown alongside the popularity of fantasy cosplay as well as the availability of inexpensive monofins used in the construction of mermaid costumes. These costumes are typically designed to be used while swimming, in an activity known as mermaiding. Mermaid fandom conventions have also been held. Professional female divers have performed as mermaids at Florida's Weeki Wachee Springs since 1947. The state park calls itself "The Only City of Live Mermaids" and was extremely popular in the 1960s, drawing almost one million tourists per year. Most of the current performers work part-time while attending college, and all are certified Scuba divers. They wear fabric tails and perform aquatic ballet (while holding their breath) for an audience in an underwater stage with glass walls. Children often ask if the "mermaids" are real. The park's PR director says "Just like with Santa Claus or any other mythical character, we always say yes. We're not going to tell them they're not real". Mermaid carved on a capital of the Rio Mau Monastic church (1151). A stone coat of arms in Santo Domingo church (Pontevedra, Galicia), 16th century. Mermaid in Fefiñans Manor house (Cambados, Galicia), 16th century. ^ a b c "Mermaid". Dictionaries. Oxford. Retrieved 16 April 2012. ^ "Mermaid". Online Etymology Dictionary. ^ "What are Sirenians?". Sirenian International. Archived from the original on 2012-07-20. Retrieved 2012-07-21. ^ "Experts: Sea cow 'sirens' fuel mermaid mythology; sailors' deprivation sparked images". Underwater times. December 25, 2005. Retrieved October 25, 2012. ^ Kallen, B; Castilla, EE; Lancaster, PA; Mutchinick, O; Knudsen, LB; Martinez-Frias, ML; Mastroiacovo, P; Robert, E (1992). "The cyclops and the mermaid: an epidemiological study of two types of rare malformation". Journal of Medical Genetics. 29 (1): 30–5. doi:10.1136/jmg.29.1.30. PMC 1015818. PMID 1552541. ^ "A surviving infant with sirenomelia (mermaid syndrome) associated with absent bladder". Journal of Pediatric Surgery. 25 July 2003. doi:10.1016/S0022-3468(03)00286-0. Archived from the original on 2 March 2008. Retrieved 2008-02-16. ^ a b c d e Black, Jeremy; Green, Anthony (1992). Gods, Demons and Symbols of Ancient Mesopotamia: An Illustrated Dictionary. The British Museum Press. pp. 131–132. ISBN 0-7141-1705-6. ^ Rostovtseff, M. (January 1933). "Hadad and Atargatis at Palmyra". American Journal of Archaeology. 37 (1): 58–63. doi:10.2307/498042. JSTOR 498042. ^ Strabo 16.785; Pliny, Natural History 5.81. ^ Folktales from Greece, p. 96, ISBN 1-56308-908-4 . ^ Hansen, William (2017). The Book of Greek & Roman Folktales, Legends & Myths. Princeton, New Jersey: Princeton University Press. pp. 169–170. ISBN 9780691170152. ^ a b Irwin, Robert (2003). One Thousand and One Nights: A Companion. Tauris Parke Paperbacks. p. 209. ISBN 1-86064-983-1. ^ "FOTOS El diablo, un pez para la magia negra - El Universal Veracruz". Archived from the original on 2014-05-28. Retrieved 15 November 2014. ^ Wood, Rita (March 2010). "The Norman Chapel in Durham Castle" (PDF). Northern History. XLVII (1): 31. Retrieved 25 July 2012. ^ "The Norman Chapel". Architecture. Durham World heritage. Retrieved 11 May 2012. ^ a b Briggs 1976, p. 287. ^ Child, Francis James (1965), The English and Scottish Popular Ballads, 2, New York: Dover, p. 19 . ^ Briggs, KM (1967), The Fairies in English Tradition and Literature, London: University of Chicago Press, p. 57 . ^ Briggs 1976, p. 288. ^ Briggs 1976, p. 290. ^ "St. Senara's Church". Zennor Parish Council. Archived from the original on 2012-03-23. Retrieved 2012-06-16. ^ Briggs 1976, p. 289. ^ Briggs 1976, pp. 266–7. ^ a b Briggs, Katharine (1976). An Encyclopedia of Fairies. Pantheon Books. pp. 22–23. "Ben-Varrey". ISBN 0-394-40918-3. ^ Donald, A.K. (1895). "Melusine, Compiled (1382–1394 A.D.) by Jean D'Arras, Englisht About 1500". Kegan Paul, Trench, Trubner. Retrieved November 20, 2012. ^ Andersen, Hans Christian (2007-12-13). "The Little Mermaid". IL: Gilead. Retrieved 2012-07-21. ^ Aeppel, Timothy (July 27, 2009). "In a Mermaid Statue, Danes Find Something Rotten in State of Michigan". The Wall Street Journal. Dow Jones & co. Archived from the original on July 27, 2009. Retrieved 2012-11-19. ^ "1989 Academy Awards Nominations and Winners by Category". Box Office Mojo. Retrieved 2014-05-16. ^ "Double Dip Digest: The Little Mermaid". IGN. 2006-10-03. Retrieved 2009-12-23. ^ Walt Disney Studios, The Little Mermaid (film, 1989). ^ Ebert, Roger (1989-11-17). "The Little Mermaid review". Chicago Sun-Times. Retrieved 2009-12-23. ^ a b Ivanits, Linda J. (1992). Russian folk belief. Schiller, Sophie illustr. (1st pbk. ed.). Armonk, NY: M.E. Sharpe. p. 76. ISBN 978-0-87332-889-0. ^ Illes, Judika (2009). The encyclopedia of spirits: the ultimate guide to the magic of fairies, genies, demons, ghosts, gods, and goddesses. New York: HarperOne. p. 871. ISBN 978-0-06-135024-5. ^ Warner, Elizabeth (2002). Russian myths. Austin, TX: Univ. of Texas Press. p. 42. ISBN 978-0-292-79158-9. ^ Kelly, Katherine E., ed. (1996). Modern drama by women 1800s–1930s: an international anthology. London: Routledge. p. 326. ISBN 978-0-415-12493-5. ^ Ivanits, Linda J. (2015-03-04). Russian Folk Belief. Routledge. ISBN 9781317460398. ^ Donkin, R.A. (1998). Beyond price : pearl and pearl-fishing : origins to the age of discoveries. Philadelphia: American Philosophical society. p. 7. ISBN 978-0871692245. ^ Belfield Dennys, Nicholas (1876). The Folk-Lore of China, and Its Affinities with That of the Aryan and Semitic Races. Trübner and Co. p. 115. ISBN 978-1402149733. ^ Sastri, Satyavrat (1982). Studies in Sanskrit and Indian culture in Thailand. Parimal Publications. p. 63. ^ Drewal, Henry John (2008). "Introduction: Charting the Voyage". Sacred Waters: Arts for Mami Wata and other divinities in Africa and the diaspora. Bloomington: Indiana University Press. p. 1. ISBN 978-0-253-35156-2. .
^ "Diccionario de Argot Cubano". Conexion Cubana. Retrieved 2012-04-24. ^ Bennett, Lennie (July 10, 2008). "Four exhibitions woven into 'Textures'". Tampa bay. St. Petersburg Times. Archived from the original on December 1, 2008. Retrieved 2009-04-25. ^ "Hibiscus tiliaceus – Hau (Malvaceae) – Plants of Hawaii". Hear.org. Retrieved 2012-04-24. ^ English, Leo James, Tagalog-English Dictionary, Manila: Congregation of the Most Holy Redeemer; National Book Store, ISBN 971-91055-0-X , 1583 pp. ^ Illes, Judika (2009). The Encyclopedia of Spirits. HarperOne. p. 768. ISBN 978-0-06-135024-5. ^ Dinnerstein, Dorothy (1963), The Mermaid and the Minotaur, New York: Harper & Row . Cited by "History", Mermaids, Northstar Gallery . ^ Klein, Karin (2012-07-05). "No mermaids, no zombies, feds say. Who's next – Tinkerbell?". Los Angeles Times. Retrieved 2012-07-21. ^ Walker, Sally M. (1999). Manatees. Minneapolis: Carolrhoda Books. p. 7. ISBN 1-57505-299-7. ^ "Pirates". Radio World Service. BBC. Retrieved July 26, 2011. ^ "Folklore Examples in British Columbia". Folklore. 2009-01-11. Retrieved 2012-04-24. ^ "A Mermaid in the Susquehanna". YorksPast. York Daily. June 8, 1881. Retrieved January 2, 2016. ^ "Is a Mermaid Living Under the Sea in Kiryat Yam?". Haaretz. 12 August 2009. Archived from the original on 7 January 2010. Retrieved 22 September 2015. ^ Newling, Dan (6 February 2012). "Reason for Zimbabwe reservoir delays... mermaids have been hounding workers away!". Daily Mail. Retrieved 8 February 2012. ^ Yanni, Carla (2005). Nature's Museums: Victorian Science and the Architecture of Display (1st pbk. ed.). New York: Princeton Architectural Press. p. 20. ISBN 1-56898-472-3. ^ "Urban Legends Reference Pages: Mermaid to Order". Snopes. Retrieved 2012-04-24. ^ McClain, Craig; Steingass, Sheanna (October 30, 2013). "Five Reasons Why Mermaids Can't Physically Exist". DeepSeaNews. Retrieved March 17, 2019. ^ Banse, Karl (January 1990). "Mermaids - Their Biology, Culture, and Demise" (PDF). American Journal of Limnology and Oceanography. 35 (1): 148–153. Retrieved March 17, 2019. ^ Powell, John, ed. (2001). Biographical dictionary of literary influences: the nineteenth century, 1800–1914. Westport, CT: Greenwood Press. p. 20. ISBN 978-0-313-30422-4. ^ Brandes, George Morris Cohen (1902). The Romantic School in Germany (1873). New York: The Macmillan Co. p. 301. ^ Wullschläger, Jackie (2002). Hans Christian Andersen: the life of a storyteller (University of Chicago Press ed.). Chicago, IL: University of Chicago Press. p. 176. ISBN 978-0-226-91747-4. ^ Mermaids of Earth (map) . ^ Chiu, Felicity Fei-Hsien (2010-07-16). "Taiwan New Sound Concert–Requiem for the 228 Incident". Wretch. Retrieved 2012-07-24. ^ Prettejohn, Elizabeth; et al. (2008), J. W. Waterhouse: The Modern Pre-Raphaelite, London: Thames & Hudson, p. 144, ISBN 978-90-8586-490-5 . ^ Given-Wilson, Chris, ed. (2002). Fourteenth Century England. 2. Woodbridge, UK: The Boydell Press. p. 121. ISBN 0-85115-891-9. ^ "The History of the Kingdom of The West: Royalty". West kingdom. Archived from the original on 2013-02-25. Retrieved 2012-07-24. ^ Sloan Evans, William (1854). A Grammar of British Heraldry. London. p. 145. ^ "The Mermaid". UK: UCL. Retrieved 2008-02-11. ^ "Warsaw Mermaid's Statue". Archived from the original on 2008-12-07. Retrieved 2008-07-10. ^ "History of Warsaw's Coat of Arms". e-Warsaw. Retrieved 2008-07-10. ^ Hickey, Elizabeth (1971). "Monument to Sir Thomas Cusack". Records of Meath Archaeological & Historical Society. Meath, Ireland: Meath Archaeological & Historical Society. IV (5): 76, 84. ^ Chareuncy, Don; Leach, Robin (August 14, 2011). "Photos: Mermaid convention breaks record(s), returns to L.V. next year". Las Vegas Sun. Retrieved October 1, 2012. ^ Cruey, Joshua C. (August 11, 2012). "Photos: Mer-Palooza Mermaid Convention in Orlando". Orlando Sentinel. Retrieved October 1, 2012. ^ Rahn, Herrman, ed. (1 September 1965). "Physiology of Breath-Hold Diving and the Ama of Japan". Publication 1341. US National Research Council: 25, 41. Retrieved 26 July 2012. ^ Stott, Rebecca (2004). Oyster. London: Reaktion Books. p. 194. ISBN 978-1-86189-221-8. ^ Connolly, Kevin P. (2012-07-05). "Florida mermaids not real: Weeki Wachee mermaids, other 'aquatic humanoids' are unreal, feds say". Orlando Sentinel. Retrieved 2012-07-26. ^ Schiller, Jakob (2012-04-20). "Professional Mermaids Are Lost Treasure of Florida Park". Wired. Retrieved 2012-07-26. ^ Abbey, Melissa (2012-07-05). "Mermaids don't exist... or do they?". CNN. Archived from the original on 2012-07-25. Retrieved 2012-07-26. Briggs, K. M. (1976). An Encyclopedia of Fairies, Hobgoblins, Brownies, Boogies, and Other Supernatural Creatures. Random House. ISBN 0-394-73467-X.